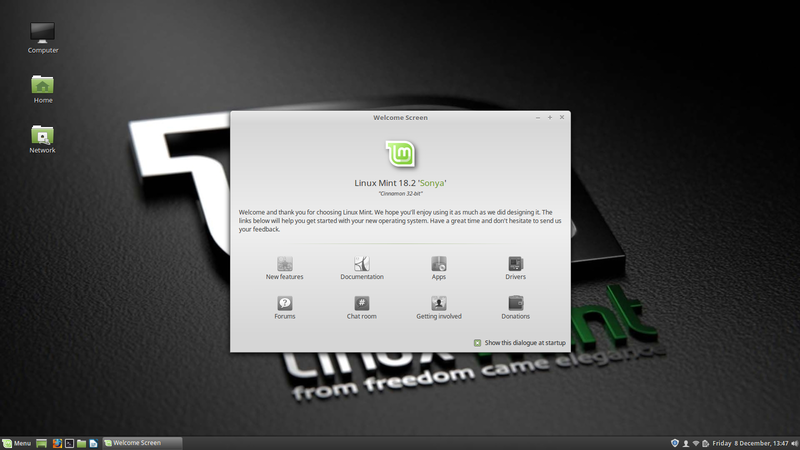 Installing Linux Mint has been made very easy indeed. Firstly, set up your bios boot order so that either USB or DVD drives are first on the list – or at least before the hard drive (depending upon which one you’re using). 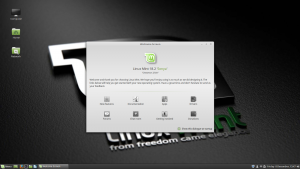 On boot-up Linux Mint will start a “live” version of the distro to run on your machine. This gives you the opportunity to evaluate it before installing. In the live preview, almost all that is installed is available here. Flash games and streaming video are unavailable. These require up-to-date downloads, so are not available in this mode. Viewing the proposed installation is absolutely brilliant. If nothing else, it allows you to get a working feel for what’s going to be installed. To begin with I was a little apprehensive about installing Linux on the XP machine. Experience with Windows has shown me that often dual boot is either difficult or impossible. However, on this occasion, it was not an issue. The Linux distro has an option to install alongside another OS – like XP, Vista – even 10. I can also include myself in the set of people that felt that as Linux is Unix based, it would be predominantly command-line orientated. My first job in computing was with a company that provided visualisation software for civil engineers. They built photo-realistic renderings of road systems to housing estates to golf courses. Their Unix boxes used X-Windows. This was in its infancy and the machines operated very differently to Windows systems (3.1 and 3.11). I know, I should have my wrist slapped for not considering that X-Windows might have had a bit of a tweak. Nevertheless, I was apprehensive and concerned over having to learn a whole heap of the “spells”, “incantations” and “rituals” needed to make Linux run. Seeing that Linux was graphical was a real bonus! So, put in your DVD or your USB and fire her up! An icon on the desktop when double-clicked, will install the system to your hard drive, but before it does, it asks whether you want it to be a) the only OS on the computer, or b) as a second operating system alongside the existing system. If a), then it will wipe the hard drive, remove all partitions and create its own. Otherwise, it will tell you about the partition(s) needed for its installation. There is an option to define your own partition sizes, otherwise it will create partition(s) for itself within the free space on the hard drive. This is necessary, because Linux uses a completely different file system on its hard drive than Windows. It can read and write to and from drives formatted in Fat32, but otherwise it uses its own file system. There are a small number of user inputs required during installation. You will be prompted for the go-ahead to install proprietary packages (like Flash). Also, keyboard and language format, where you are in the world (for time purposes) and username and password. However, that’s about it. Linux whizzes through the installation in a matter of minutes. This differs vastly from a Windows installation. I recently spent an entire afternoon installing Windows 10 on a brand new machine for someone. During the installation, when it wasn’t downloading gigabytes of data, it prompted me for input. It installed umpteen trial versions of software with no way of being able to refuse. These trial versions took precedence over subsequent installations, which I didn’t know about. It required two hours of uninstalling and associations with new file types to clear it all up. It was therefore refreshing that this was quick and left behind absolutely zero advertising, zero trial versions and a system where what you see is what you get, there are no nasty surprises. More importantly, I wasn’t hoodwinked into providing all and sundry with personal information. If you look here, you’ll see that there are many versions of Linux. While I have chosen Mint, you could easily choose another like Fedora, Arch or Red Hat, to name but a few. It all depends upon what you need. The distro I downloaded was just over 1.5 Gb and was chosen because it included LibreOffice instead of Open Office (provided in the bundle from Ubuntu; another distro I looked into). I did not choose this one because it looked prettier. I didn’t find a great many screenshots of Mint or any of the other versions of Linux. In all honesty, bells and whistles are not as important as being able to do the job quickly and efficiently. The upshot was that installing Linux Mint was really quick and easy to do. It was up and running in mere minutes. After a quick look through, I decided that keeping XP wasn’t an option because with XP, using the internet was a worrying experience. Chrome no longer supports it and doing anything on-line is a painfully slow experience. Much of that can probably be attributed to having a really crappy machine.